Home / Press / Archive by category "Diamondback"
When Joshua Turskey joined Terps Against Hunger the fall of his freshman year, there were only four students in the group dedicated to packaging meals for food banks and other partners in the Washington, D.C. area. 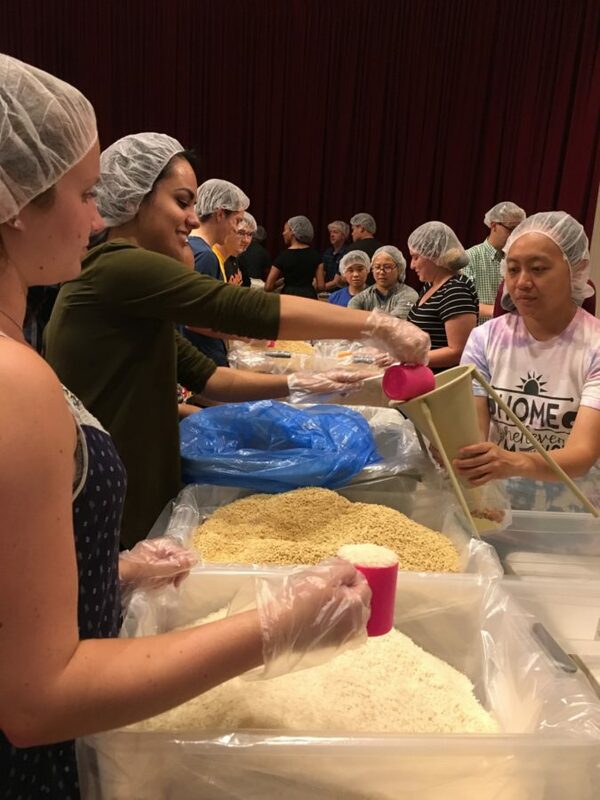 Since then, the group has grown to more than 200 members, said Turskey, the junior architecture major who now serves as Terps Against Hunger president, and Sunday the organization packaged its one millionth meal. University President Wallace Loh, U.S. Rep. Chris Van Hollen and hundreds of students attended Terps Against Hungers’ homecoming service event in Xfinity Center, where volunteers packaged meals for more than 10 hours. Terps Against Hunger aims to educate students on the issues of hunger, enlist them to come help pack meals and empower students to act on their own passions, Turskey said. He added that he was excited about the “great turnout” of students that the event brought together. Loh and Van Hollen spoke at the service event, both discussing the university’s new “Do Good Initiative,” a $75 million effort to support student philanthropy and social innovation. The initiative will build on the efforts of the university’s Center for Philanthropy and Nonprofit Leadership and the “Do Good” Challenge, in which student groups compete for money to support their philanthropic work. Terps Against Hunger won the “Do Good” Challenge last year. As a congressman, Van Hollen said he had been fighting a political battle to maintain and expand the policies that fight food insecurity, but he stressed that everything can’t be done solely through the government. In his speech, Loh also said students and community members are the ones who drive change. “It’s about translating [students’] passion and their education into social impact and serving others, and I think that’s what democracy is all about,” Loh said. “It’s not only what the government does, it’s about what individual citizens do. Small acts of service put together is what makes America great. Bob Grimm, the director of the Do Good Institute, said he saw many parallels between the work that he is trying to promote and the work that Terps Against Hunger does. The university has been holding Do Good Challenges for five years, and Terps Against Hunger began when its founder, Jonathan Fix, received a seed fund from the competition two years ago, Grimm said. The organization used the money to run a pilot event where they packaged 6,000 meals, he added. Junior public health science major Ophelia Imuze said the issue of hunger is important to her because she has seen its effects in her home country of Nigeria. “It means a lot to me because where I come from, I know a lot of people don’t have food to eat,” Imuze said. “It’s a big deal that I can help out. Many members of Greek life were also present at the event, and junior Isabella Kalender, Alpha Phi chapter president said Terps Against Hunger has played a major role in efforts on the campus to fight food insecurity. Volunteers pack meals for food insecure famliies at the Memorial Chapel on Sept. 20. Photo by Carly Taylor. Student group Terps Against Hunger and the University of Maryland Alumni Association came together for the first time inside the Samuel Riggs IV Center on July 17 to package 42,000 meals for the Capital Area Food Bank. 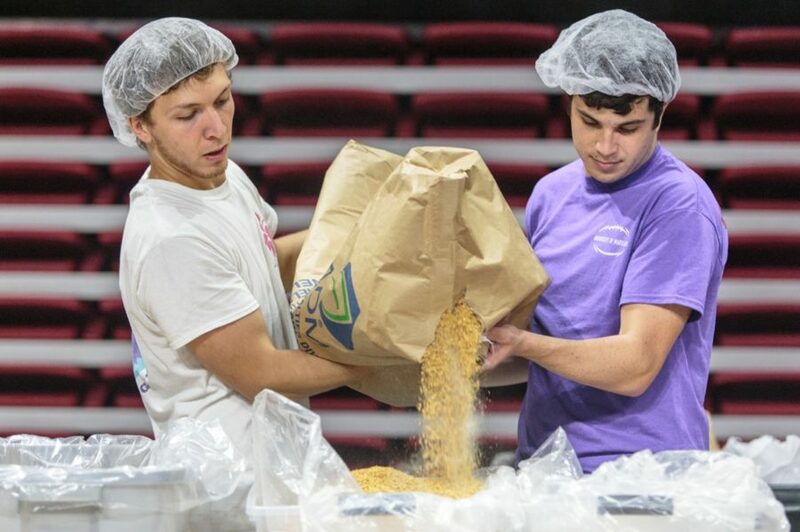 About 190 fellow students, alumni and their family and friends worked for two hours to pack high-nutrition meals, surpassing their goal of 20,000 meals, said Jonathan Fix, Terps Against Hunger founder. The kinds of food packaged included rice, soy protein, dried vegetables and more. “This event was originally planned for 100,000 meals, but with the short time frame we decided to make it an introductory event and to show [the alumni and university community] what we were doing,” Fix added. The alumni association had no trouble saying “yes” to Terps Against Hunger, as it often looks for opportunities to help fellow alumni reconnect with the university through service projects like this one, Alexander said. “We team up with other networks and chapters and organizations to support their efforts,” she said. Partnering with the alumni association was also a step forward in how Terps Against Hunger wants to hold future events, Fix added. This event was the first of three events that the two organizations will be working on together, with the next one taking place during homecoming in September. Mira Mehta, the Expanded Food and Nutrition Education Program director for the nutrition and food science department, said she is very happy that organizations on the campus are coming together to try and help solve hunger. In the Washington metro area alone, over 641,000 residents are at risk of or experiencing hunger. About 200,000 of them are children, according to the Capital Area Food Bank website. In Maryland, a 2012 survey found that 16.2 percent of households reported an inability to afford enough food, according to the state’s hunger solutions website. The root causes for hunger often stem from financial hardship, Mehta said, though perspectives on what qualifies as hunger can differ depending on how an individual defines food insecurity. Food insecurity is defined as the unavailability or limited availability of “nutritionally adequate and safe food,” according to the U.S. Agriculture Department. From 2009-’11, about 12.5 percent of households in this state were food insecure, the website noted. University of Maryland student organizations Terps Against Hunger and Medfund each won a $5,000 grand prize at Tuesday night’s Do Good Challenge, which awarded $20,000 overall to student philanthropy teams. The challenge — now in its fifth year — was sponsored by Morgan Stanley, the public policy school and the business school, drawing 87 student teams that competed for eight weeks. The event, held at the Samuel Riggs IV Alumni Center, involved the final three teams in the project and venture categories each giving a five-minute presentation to a panel of three judges in hopes of securing the grand prize. “We’ve talked about this sort of being the combination of American Idoland Shark Tank,” said Toby Egan, the faculty adviser for the challenge and a professor at the public policy school. The three project teams, which Egan defined as “event-centric” and affiliated with a parent organization, were No Taboo. Period., Preventing Sexual Assault and Terps Against Hunger. The venture teams, which are independent, student-run organizations, were Annie’s Children, the Love Blanket Project and Medfund. Terps Against Hunger, also the winner of the $2,500 audience choice award, provides meals to food-insecure families in the Washington metropolitan area. Patrick Prommel, Medfund co-founder and a senior finance major, said the demands of the hospital in Bolivia that his organization supports will determine how the award money is used. Preventing Sexual Assault won the $2,500 second-place award in the project category, and No Taboo. Period. won the $1,000 third-place award. In the ventures category, Annie’s Children won second place and $2,500, while the Love Blanket Project won third place and $1,000. Seven other semi-finalists were also offered a chance to win the showcase audience award of $750 before the Do Good Challenge began. People who attended the event were given “Do Good Dollars” to vote for their favorite semi-finalist, and the top two teams pitched their organization to the audience. A Helpful Hello, an organization that provides resources for students to talk to homeless people, won the award through a text-message voting system. 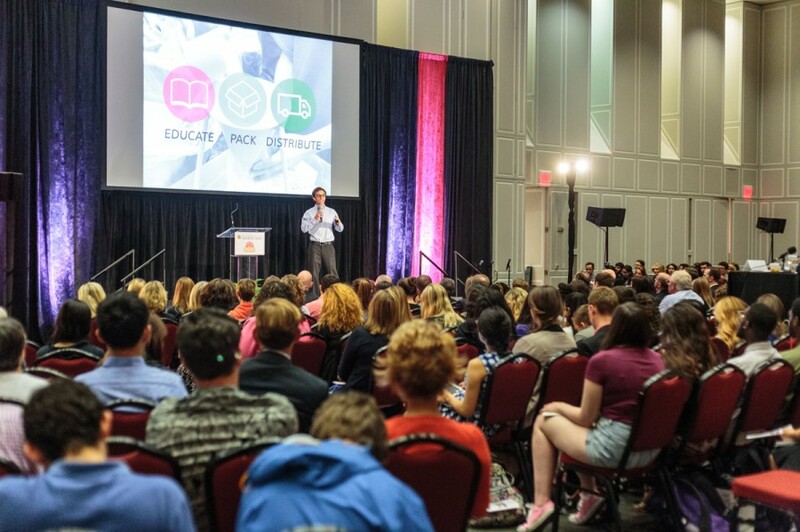 While audience members decided the winners for the showcase audience award and audience choice award, three judges, including former Do Good Challenge winner Sagar Doshi, decided the grand prize winners in the project and venture categories. “The way that we judge them is really a combination of how well they align their mission with the execution of their organization and the way that they implement either their venture or project,” said Egan, who helped to award accelerator funding to 30 or 40 student groups in the fall and has continued to coach the student leaders. For eight hours Monday, rice scattered the wooden floor of Stamp Student Union’s Grand Ballroom while pop music blared. At any given time, there were at least 300 hair-netted heads, all bowed over tables crowded with bags and containers. Between 2,000 and 3,000 University of Maryland students, faculty and community members put together about 250,000 meals — more than double what they made during last year’s inaugural Terps Against Hunger event. The meals packaged will be enough to feed 150 families of five for a year, all located in Washington, Montgomery County and Prince George’s County. The food will be handed out by partner organizations such as the Capital Area Food Bank. Terps Against Hunger hosted its first event during last year’s homecoming, drawing 1,500 volunteers who prepared 100,000 meals in three to four hours, Terps Against Hunger President Jonathan Fix said. The club grow from five to 50 members in the past year, allowing students to form connections with parties on this campus, which helped facilitate the fundraising of $29,000 by the morning of the event through crowdfunding site Launch UMD, Fix said. University-affiliated organizations, such as Maryland Hillel, Terp Thon, the Residence Hall Association, the public health school, the agriculture and natural resources college, the Department of Fraternity and Sorority Life and the Gemstone and CIVICUS living-learning programs all contributed either money or volunteers to the event — though the Student Government Association declined to provide funding this year. The SGA’s finance committee’s discretionary guidelines state groups applying for more than $1,500 in funding must meet a budget deadline of 60 days before the event, which Terps Against Hunger missed. It is also against state law to use state money to fund a 501(c)3 nonprofit organization, SGA Finance Vice President Sarah Niezelski said. Terps Against Hunger also solicited funds from the University View, G&G Outfitters and Terrapin’s Turf among others, as well as crowdfunding by family and friends of the Terps Against Hunger members. Most volunteers stayed for an hour, Fix said, though many stayed longer. While many volunteers were students, there were also 300 university employees present, along with firefighters, policemen and city residents, among others. The club hopes to establish the event’s permanence as homecoming week’s official community service event, Fix said. “I’m imagining from the way today went — crossing my fingers — we will be indefinitely extended for the foreseeable future,” Fix said. Terps Against Hunger is also looking to solicit funding more strategically, asking for donations earlier in the year so as to have a better chance of obtaining them. 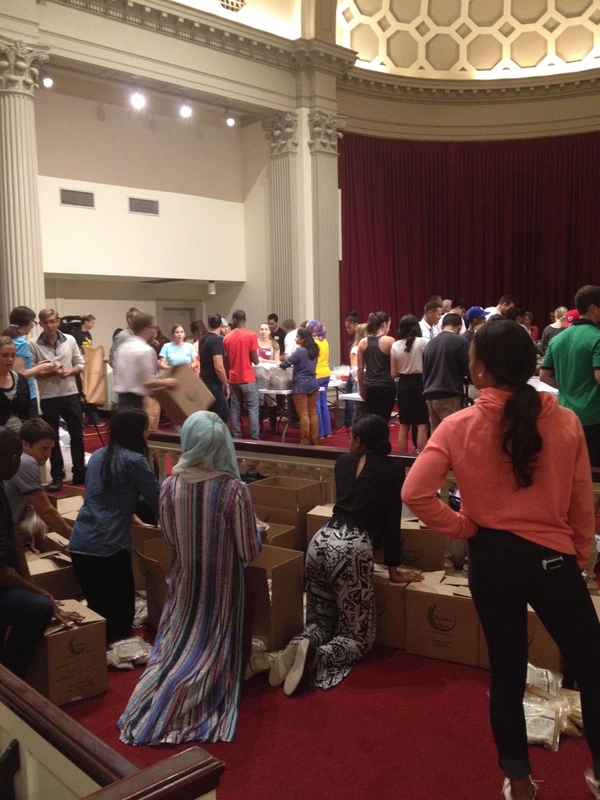 More than 150 people came out to the University of Maryland’s Memorial Chapel on Tuesday night to pack meals for children in Baltimore. 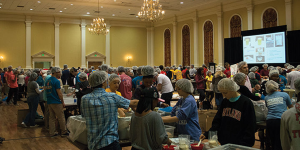 The student group Terps Against Hunger, which aims to combat hunger in the United States, partnered with different religious groups on the campus to create a food packing station in the chapel. The program started at 4:30 p.m. with a brief presentation from Terps Against Hunger members about the mission behind the group — a subset of Kids Against Hunger, which is based in Washington, D.C. — and the issues that spurred its creation. The meals packed during this event are all going to Baltimore children who don’t have adequate access to food, said senior Jonathan Fix, an independent studies major studying bioethics and epidemiology. 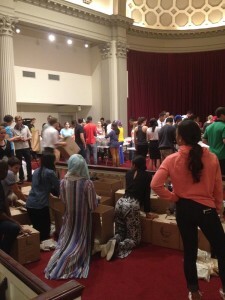 By the end of the event, the volunteers packed 10,000 meals. “[Children] don’t do as well in school, they don’t get into the college they want to, they don’t get the job they want, and it becomes a cycle that [then] affects their children,” Fix said. Terps Against Hunger member Joshua Turskey, gathered the volunteers around each station, showing them how to pack each bag with the four ingredients: soy, vitamins, rice and dried vegetables. The sophomore architecture major demonstrated the process for each and suggested the volunteers do things to have fun with it, such as chant the ingredient they were packing or yell when they needed refills. Because more volunteers came than the group members had anticipated, they split up the packing into shifts so everyone who came out could help create the meals. Not only will the children who receive the meals benefit from the service event, but volunteers did, too. Mary Sorensen, a freshman computer science major, shared that sentiment. “I liked that they put such an effort into making a meal that was the most possible advantage with the least possible cost. It was clear that they actually wanted to do something … real,” she said. Rev. Brett Pinder, the chaplain of the United Methodist Church at this university also attended the service project. He said he was glad to see that so many volunteers came out and that different religious communities came together to work.